I tested karmic-server-i386.iso version 20090927.1 in KVM. not try configuring a public IP pool yet. MANAGED-NOVLAN bit there is correct (as it is much simpler). "ERROR: you need to be on the CLC host and the CLC needs to be running"
is nothing new, just auto-registration still not working. this. Can anyone confirm or deny? it to the Karmic seeds, for both the CC and node. change to the seeds as well. # These are to instruct the init.d script on what to start. # This variable points to where eucalyptus has been installed. # FATAL'. The default is DEBUG (everything). 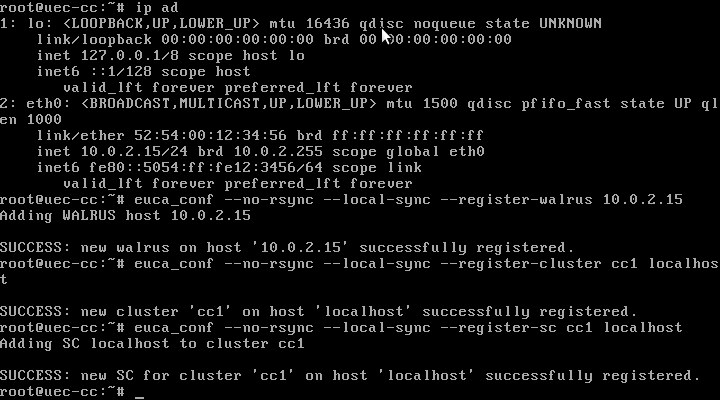 # These following are Cluster Controller configuration options. # This is the port the Cluster Controller will be listening on. # This option configures the Cluster Controller's scheduling policy. # on the first awake machine, followed by machines that are asleep). # will consider the node actually down (and not waking up). # The list of Node Controllers the Cluster Controller will communicate with. # interested in the VM Container kind). # to plug in your own Node Controller service. # The following are Node Controller configuration options. # This is the port the Node Controller will be listening on. # memory, otherwise it will use at most this value for ALL running instances. # CPU/cores it can find. # then no swap is allocated. If there is extra room left, then an "ephemeral"
# partition will be created, available as /dev/sda3 inside the VM. # recommended for normal use, but it can be useful in debugging VM startup. # needed by the maximum number of instances allowed on the node. # opposed to a NFS share) for performance reasons. # allowed to use in the cache directory (INSTANCES_PATH/eucalyptus/cache). # A generous size is recommended. Setting this to zero disables caching. # device that is attached to the same ethernet network as your nodes. # xen bridge (peth0, peth1, etc), depending on your xen configuration. # information on your local bridge setup. # directories as owned by root). # Following are example eucalyptus VM networking configurations. # assigned to the machine at CC run time. 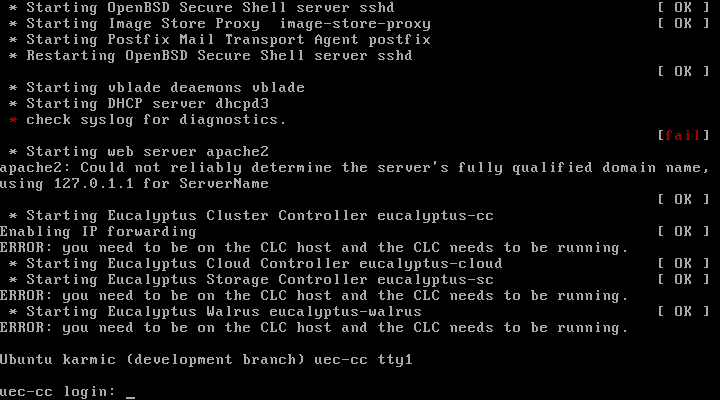 # pick up an IP from a non-eucalyptus managed DHCP server. # time (see example below for the format of this list).